Alongside a colleague, Michael O’Toole, one day workshop on transference and counter-transference. Michael and I are currently writing a book on the subject and hope to have it in press by late 2018. Plenary and delivered a workshop at the Irish Foster Carers 3 Day National Annual Conference in Letterkenny, Co Donigal in October 2015. Keynote at the ‘Risky Business’ International Dementia Conference in Sydney, Australia on the 26th and 27th June 2014. TAP invited Sir Richard Bowlby and me to speak at their Annual Meeting in Taunton on Saturday 3rd May 2014. 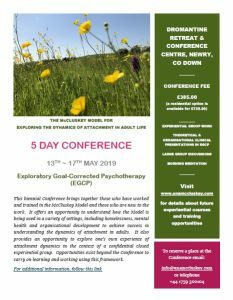 Three day course entitled ‘Exploring the Dynamics of Attachment in Adult Life for members of The Bowlby Centre 31st October 2013 – 2nd November 2013. Keynote Speaker at the 17th Annual Conference of the Responsible Gaming Association of New Mexico which took place in Albuquerque, New Mexico, August 2013. The Conference was entitled ‘Addiction as an Attachment Disorder: Implications for the Treatment of Gambling Addiciton’. Exploring the Dynamics of ttachment in Adult Life©Fear Free Caregiving: The Challenge for Psychotherapists and Counsellors, June 2013. Over a number of years, monthly attachment-based consultation groups for social care and social work staff to include carers, social workers and foster carers, offering an opportunity for staff to reflect on the crucial nature of effective caregiving when providing a service for people under stress, in despair or unwell. Presented the Sutherland Lecture in Edinburgh, October 2012. The Lecture was called “From Object Relations to Goal-Corrected Relationships”. The lecture is available on the Sutherland Trust website. Half day workshop entitled ‘Fear Free Exploratory Caregiving – The Dynamics of Attachment in Therapeutic Relations. Promoting Change in the Organisation of the Self’, September 2012. Half day workshop, June 2012. One day workshop, June 2012. Presented a half day workshop on my own work: Exploratory Goal-Corrected Psychoterapy™ (EGCP) and the Theory of Attachment Based Exploratory Interest Sharing (TABEIS) which is based on a Theory of Interaction for Caregiving (McCluskey, 2001) and the Theory of Attachment Based Exploratory Interest Sharing, developed by Heard and Lake, 1986, 1997 and 2005. Repeated a three day training programme for Clinical Psychologists, January 2012. First three day training took place in February 2011. Delivered a Seminar entitled ‘Exploring the Dynamics of Attachment in Professional Relationships’ followed by a three day workshop entitled ‘Exploring the Dynamics of Attachment in Adult Life, September 2011. Delivered a Presentation entitled “To be Met as a Person: Attachment Therapy with Adolescents and Adults, March 2011. Provided a 3 Day Training Programme for the Magellan MBA Programme, February 2011. Delivered a Presentation entitled “Dynamics of Attachment in Professional Encounters”, November 2010. Delivered a Presentation entitled “To be Met as a Person: The Dynamics of Attachment in Professional Encounters”, October 2010. Chaired the Conference entitled “Is Attachment Theory Attached to Psychoanalysis?”, October 2010. Led a Seminar, September 2010. A presentation entitled “Exploratory Group Psychotherapy: A Process of Change, Development and Transformation”, May 2010. The John Bowlby Memorial Lecture, London – Attachment in the 21st Century: Where Next? Speaker, delivering a presentation entitled “Fear Free Exploratory Caregiving: A Challenge for Therapists in the Present Social, Political and Cultural Enviroment”, March 2010. Delivered a Presentatiton entitled “To be Met as a Person: A Psychosocial Biological understanding of Human Behaviour, September 2009. Delivered a Workshop entitled “Exploring the Dynamics of Attachment in Adult Life”, 2008. Delivered a Presentation entitled “The instinctive Attachment System and Group Interaction Affect Attunement, Identification and Regulation, February 2004. This entry was posted in Previous Conferences, Workshops and Day Events. Bookmark the permalink.